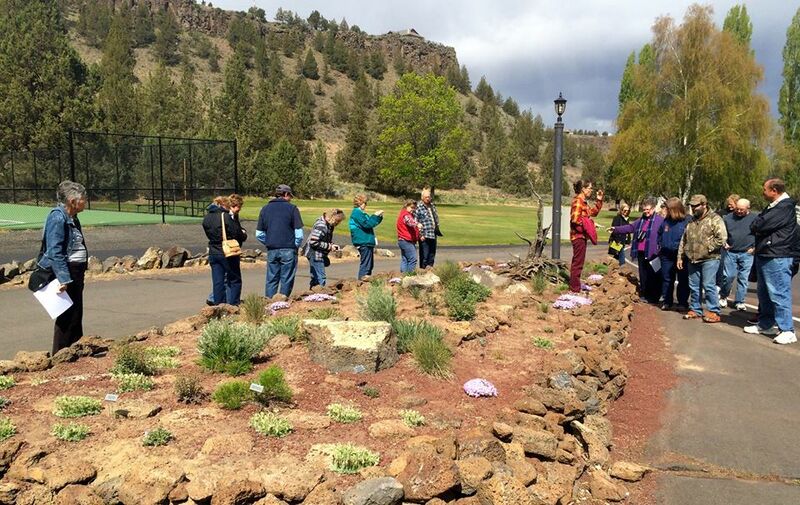 Central Oregon’s newest and largest Native Plant Interpretive Garden is located at Crooked River Ranch (CRR). With support of the CRR board and staff, volunteers with Friends and Neighbors of the Deschutes Canyon Area (FANs) have created a garden to showcase native shrubs, wildflowers, and bunchgrasses of the sagebrush steppe community. Led by Marilynne Keyser, Kristin Lucas, and Debbie Goodwin, with support from Mike Knoke, CRR’s maintenance supervisor, the 160-foot long garden was planted last May and June with over 500 plants representing more than 40 native species. Every species, though not every plant, is labeled with its common and scientific name. During the summer of 2014, the garden was watered twice a week to establish the plants. Today, the garden represents the best of xeric landscaping, with no watering required. ﻿﻿﻿Future plans include a handicapped accessible area with a bench and an interpretive sign. A checklist of the garden’s plants is available in the CRR Administration office or click the link on this page to print a copy now. You are welcome to visit the garden whenever you like. It is easily accessible 24-7, year-round. After you visit, please let us know what you think! The Native Plant Interpretive Garden at Crooked River Ranch (CRR) is located between the CRR Administrative building and the tennis courts. You are welcome to view the garden any time. ﻿Click here﻿ to view a native plant checklist.